I've been in a bit of a cooking rut lately and have been just relying on my old recipes to get me through the year. So while I've still been cooking, I didn't have anything new to post here since my move last fall. Actually, that's kind of a lie. I've had a couple new recipes that I wanted to tweak a bit more before posting. But, for the most part, I've been using my old recipes. Dealing with a longer commute home and house-related stuff, it's nice to have good standby dishes that I can make with my eyes closed. 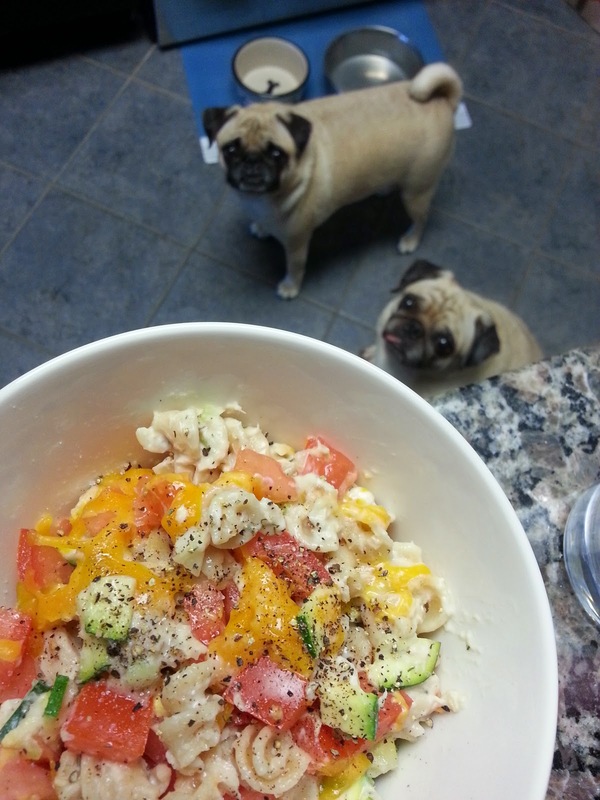 Once the oppressive heat and humidity of summer started to fade, I began craving some warm and hearty pasta dishes. 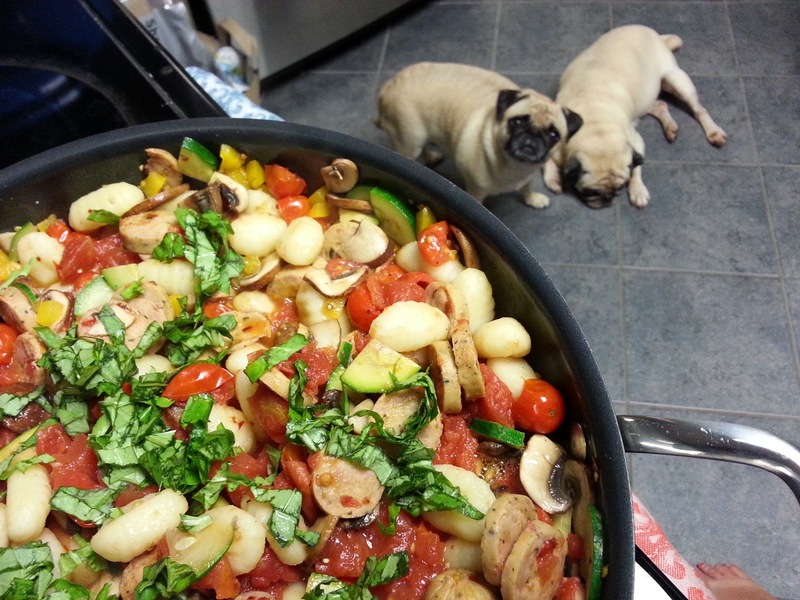 Then I came across this one-pot pasta dish that was too good to not try. And try I did and it's awesome. So easy, yet satisfying and yummy! And at the end of it I have minimal dishes to clean up. Perfect for my lazy self. Heat 1 tbsp of olive oil in a Dutch oven (or coat it with a cooking spray) over medium heat. Add 1 chopped onion and cook for 5 minutes. Add 2 tsp minced garlic and stir together for 1 minute. Add 28 oz diced tomatoes, 2 cups chicken broth, 12 oz pasta, 14 oz sliced artichoke hearts, 1-2 cups cooked chicken, 1 tsp oregano, 1 tsp rosemary, and 1/4 tsp red pepper. Stir everything together and bring to a boil over medium-high heat. Reduce heat to medium-low and cover. 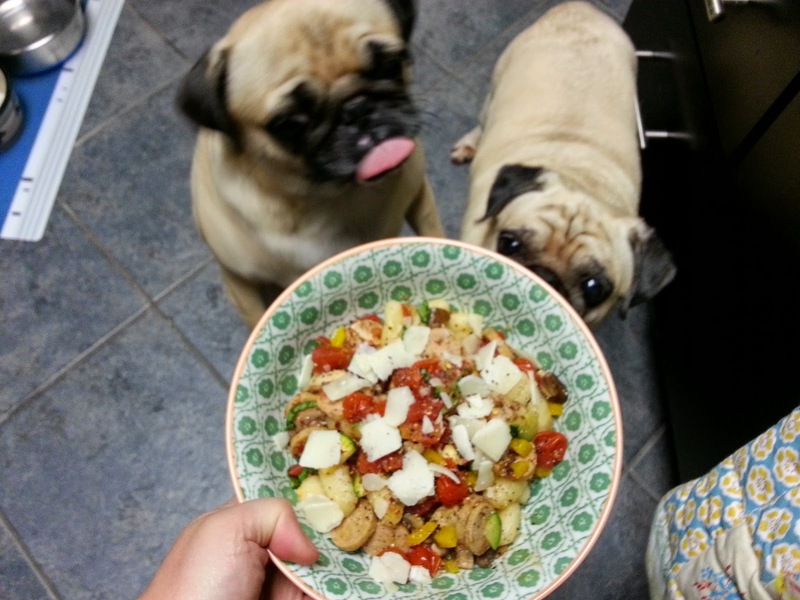 Cook for 10-12 minutes, stirring every few minutes, until pasta is slightly al dente. Remove from heat and stir in 6-8 oz baby spinach and 1/4 cup feta. Salt and pepper to taste and let stand for 10 minutes so sauce can thicken. Before serving, stir again and top with grated or shaved Parmesan (and some extra feta if you want). See, so easy! I confess that I may have been a little bit more generous with the cheese at times. Can you see the sad pug face in the corner? 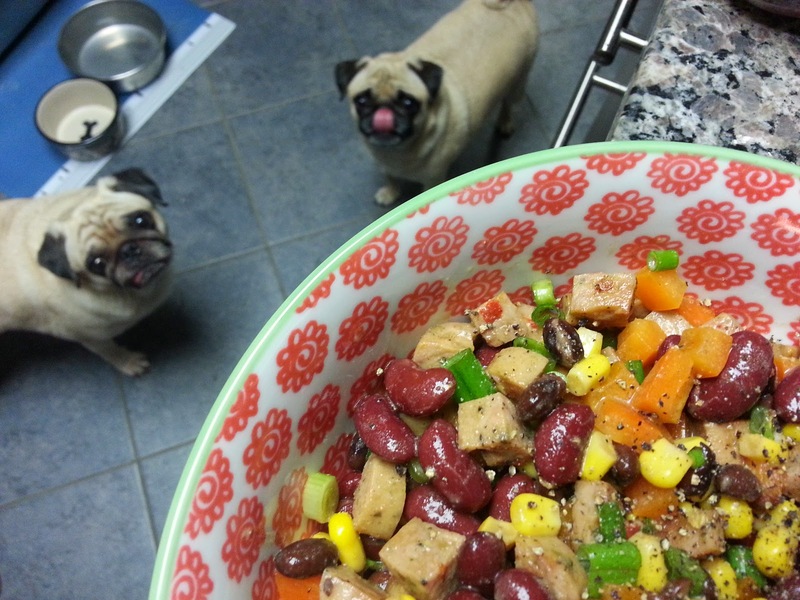 And can we get a close-up of those lil begging faces? I had them at cheese. I recently bought and moved into my first house (yay!) and I have a friend who was kind enough to come help me pack. That's true friendship! 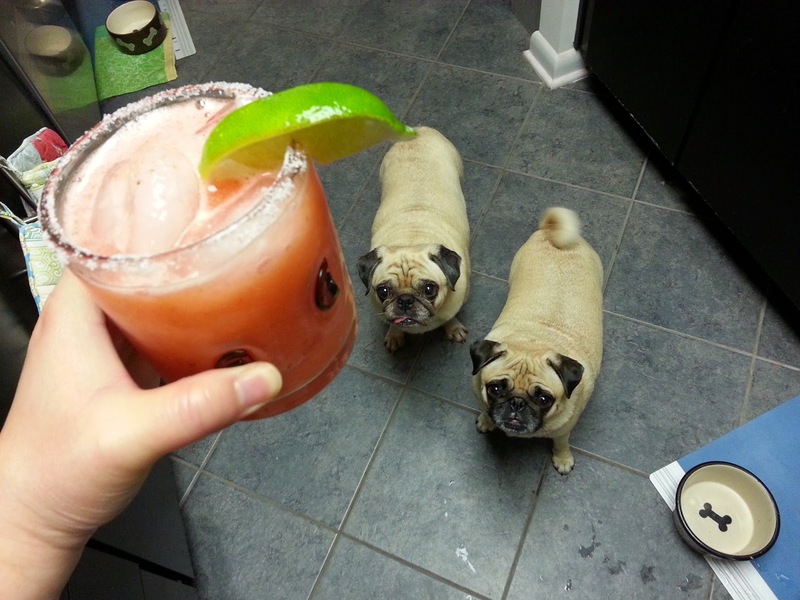 To help ease the pain of packing, we decided to make some fun margaritas. She told me about a recipe her friend used that involved watermelons and jalapeño-infused tequila and I knew we had to make it! 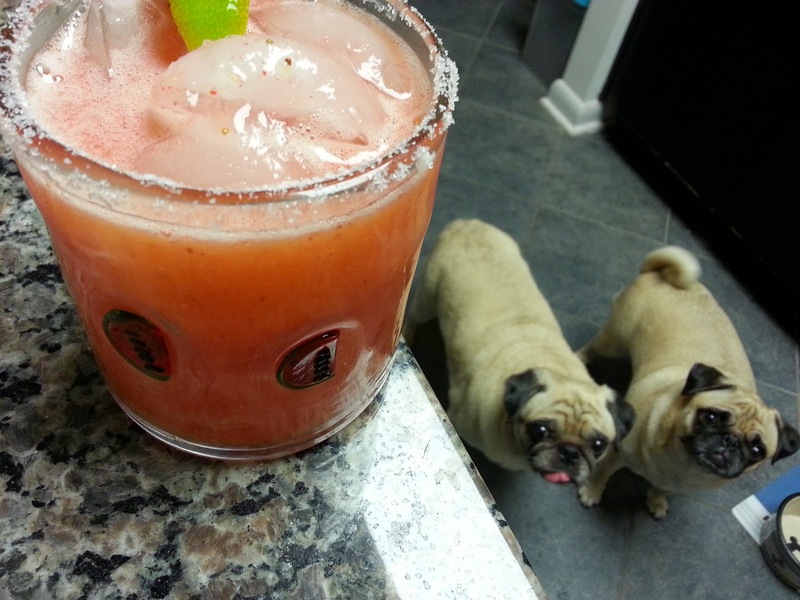 Margaritas always involve a bit more work than other drinks, but a good margarita can be delicious, fun, and relaxing. Since we are well past watermelon season, I bought a couple bags of frozen fruit which are perfect for when you're craving margaritas outside of summer! I'm not normally a big tequila drinker so I upgraded and got some top shelf tequila to make it a bit smoother and it really makes a big difference! The jalapeño-infused tequila adds a bit of kick to the drink which my friend and I love, but if spice in drinks isn't your thing, then just use regular tequila and leave out the jalapeños. But there's something about the spicy and sweet combination in these drinks that was so good that it made packing a painless breeze...well kinda. Make the jalapeño-infused tequila by placing 6 oz of tequila and 1 sliced jalapeño in a jar in the fridge for at least one hour (I did two hours one time and three hours another), but no more than several hours. The longer you let it sit, the spicier it will get! If you don't want spicy, then just omit this step and use regular tequila. In a small saucepan or pot, heat over low heat 1 cup water and 1/2 cup sugar until the sugar is completely dissolved. Set aside and let cool. Puree your favorite fruit until you have about 8 oz. I used my immersion blender because I don't have a real blender. That worked fine, but if you do that I'd recommend defrosting the fruit first. Sometimes I got impatient and blended the frozen fruit, but it took more time and I had to be more careful with fruit chunk splatter. 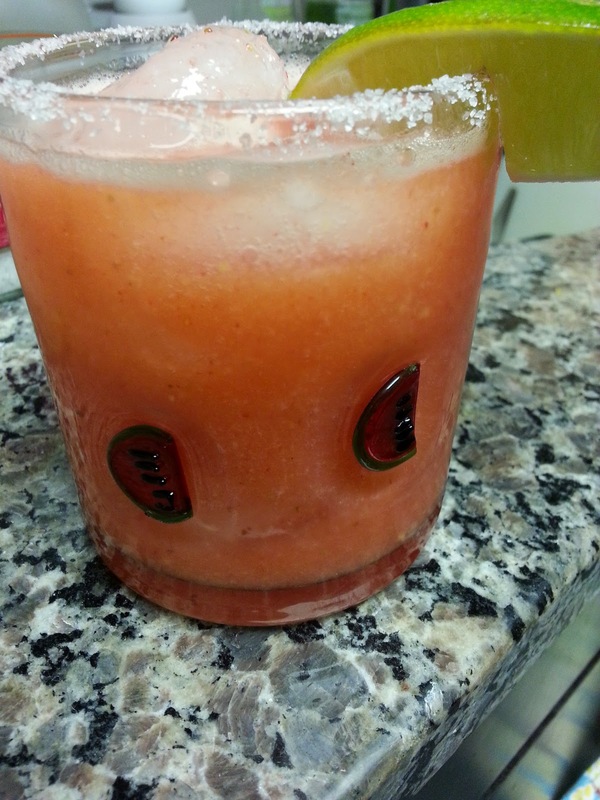 In a pitcher, mix the fruit puree, the cooled sugar-water mixture, 1 cup lime juice, and 4 oz orange liqueur together. Strain the mixture and discard the solid bits. Remove the jalapeño slices from the tequila and stir in the jalapeño-infused tequila to the margarita mixture (or if you don't want spice, just add regular tequila). For serving, cut lime wedges and use them to wet the glass rim and then dip the rims in coarse salt. 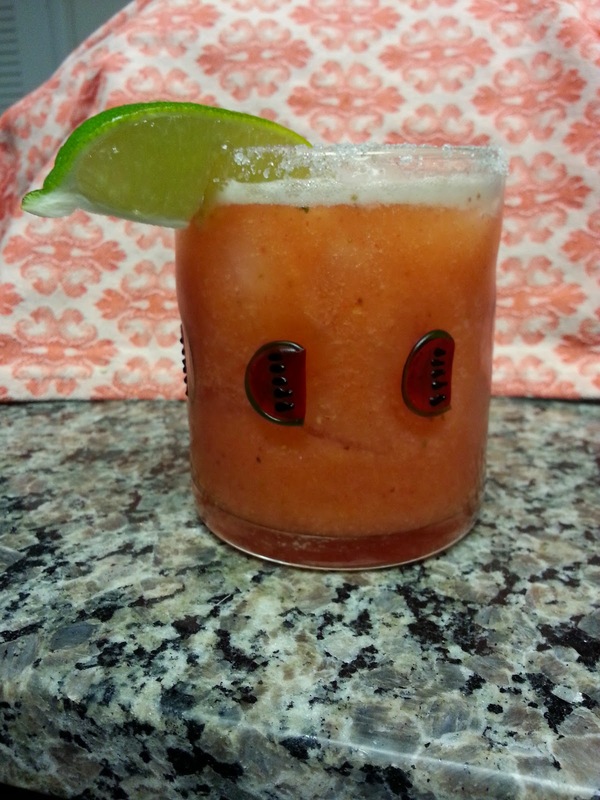 Pour the margarita into the glass over ice and garnish the glass with a lime wedge and/or jalapeno slices. The dishtowel behind the glass is to hide all the packing supplies and clutter! Even though there are watermelon slices on the cup, sadly there are no watermelons in the drink. But the pineapple, mango, and strawberry frozen fruit mix I got from Target was delicious! 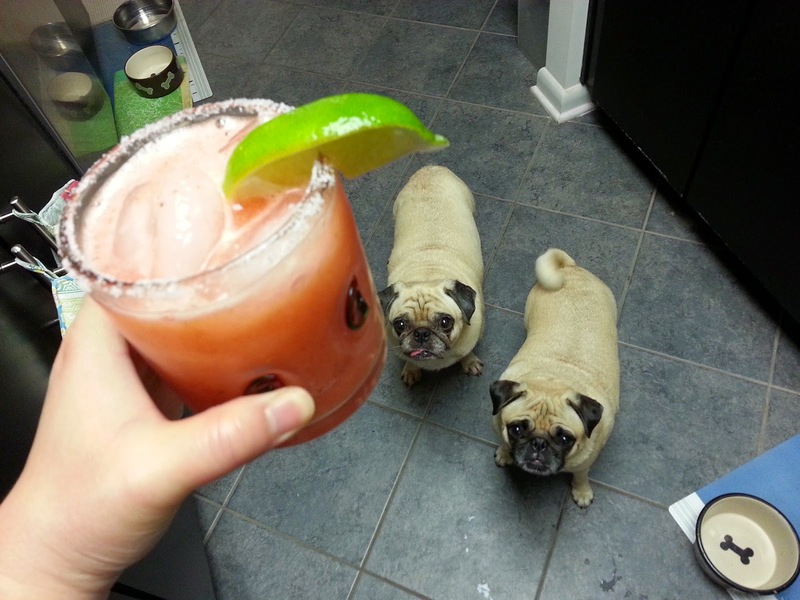 Cheers Sunny and Rosy! Let's toast to the new house and to not moving again for a very very very long time! The pugs were all confused and anxious with all the packing at the time I took these photos. Poor Suns Buns and Rose Pose. Adapted from Confections of a Foodie Bride. I really don't cook with gnocchi enough and I don't know why. They're made with one of my favorite foods (potatoes) and they're like lil pillows of heavenly goodness. 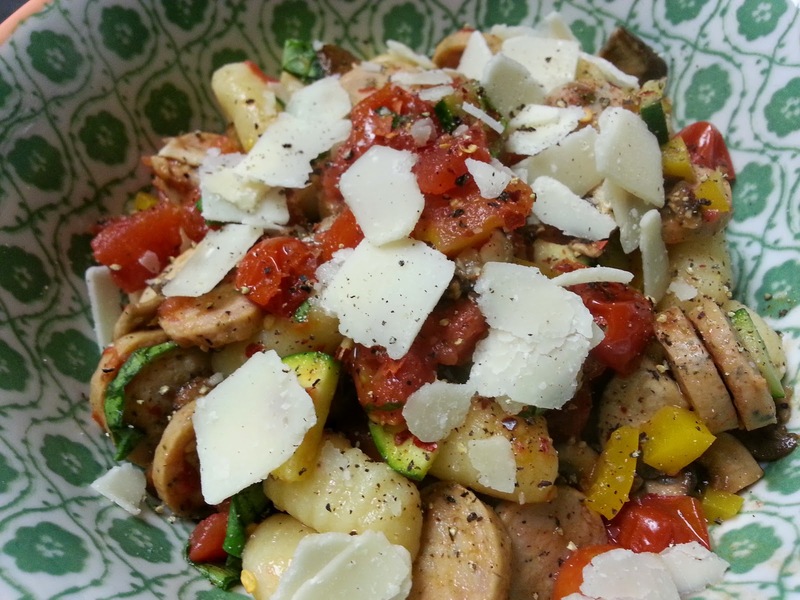 Well problem now solved because I found my perfect gnocchi recipe! This dish is super flavorful, adaptable, and quick to make. I did most of my prep work on Sunday, as usual, and then on Thursday of that week I just had to cook up the gnocchi and throw everything else in the pan. Makes for a great weeknight meal when you want something easy and yummy to make after a long day at work (and boy have I been having some long and terrible days at work lately). And while I added my current favorite vegetables and mushrooms here you can add almost whatever vegetable you have handy. 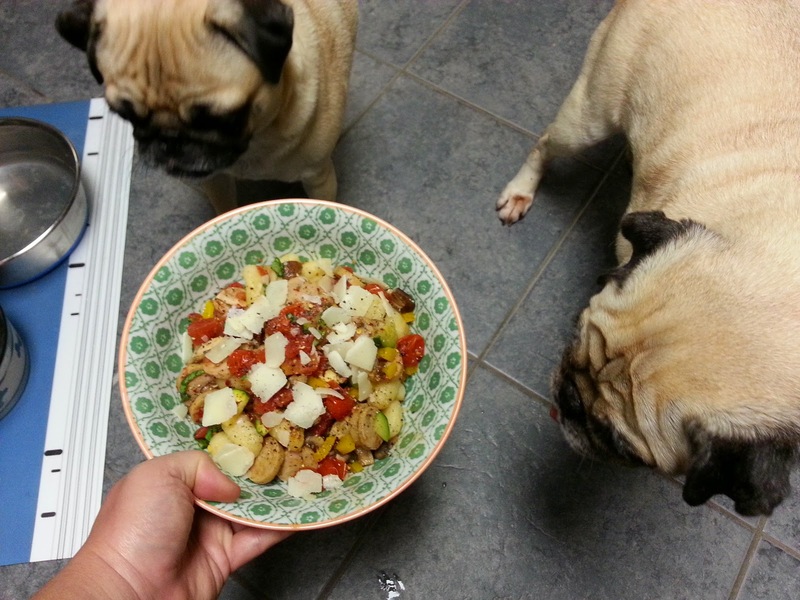 If you'd like a drier dish you can leave out the can of diced tomatoes, but I like the extra sauciness it adds. 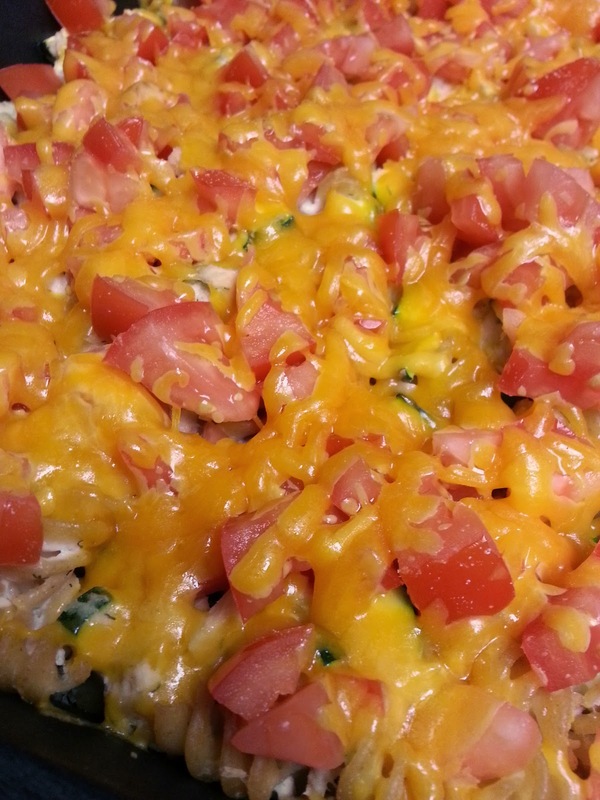 This is definitely getting added to my regular meal rotation because it's yummy and easy. 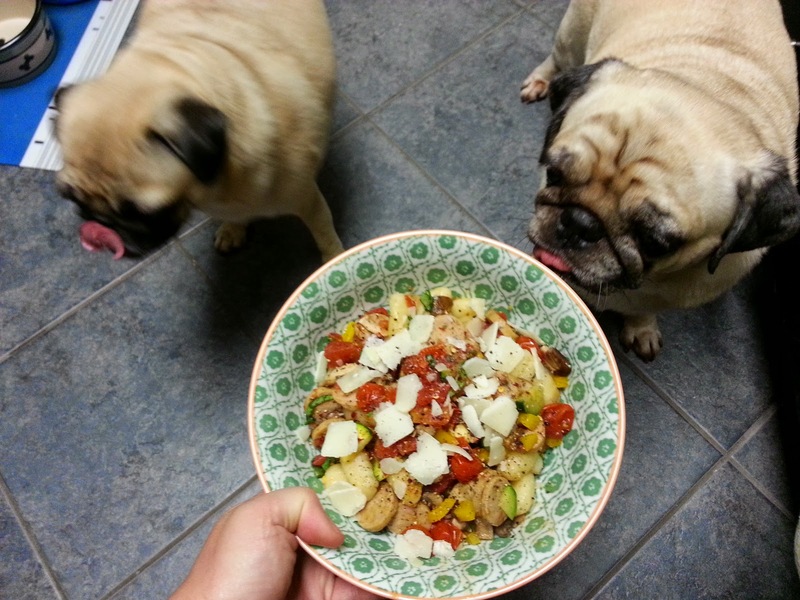 While I love all the recipes I post here, I definitely favor the easy and fast ones in my day-to-day cooking because that leaves more time for lounging with my pugs, and believe me I need a lot of that with the past few weeks I've been having at work. Boil salted water and cook 1 lb gnocchi for 2-3 minutes until the gnocchi just start floating to the top. Drain well and toss with drizzle (or spray) of olive oil (this will prevent them from sticking together). Set aside. Heat a large skillet over medium heat and spray the pan or drizzle some olive oil. Add 12 oz chopped chicken sausage and cook for 3-4 minutes or until the sausage starts to brown. Push the sausage to the side of the skillet and add 12-16 oz halved grape/cherry tomatoes and cook on high heat for 1-3 minutes. 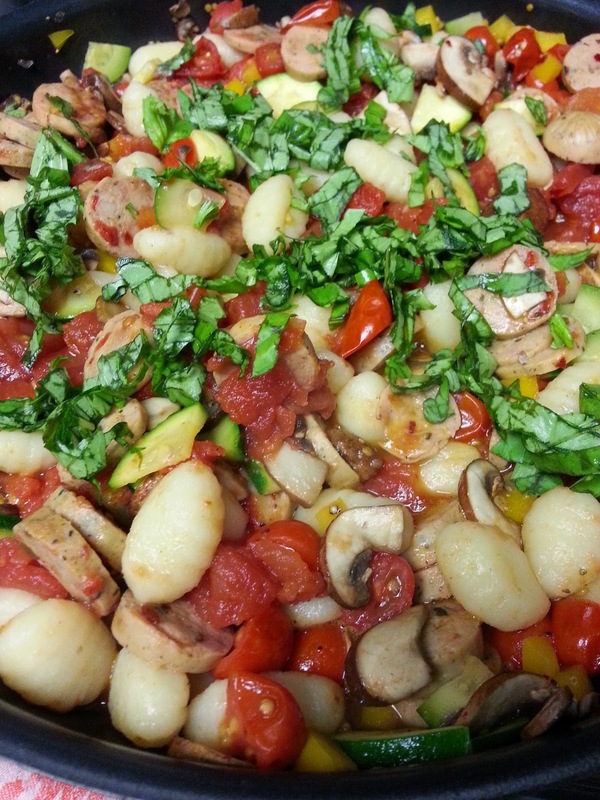 Stir the tomatoes and sausage together and add 10 oz chopped mushrooms, 1 chopped bell pepper, and 1 chopped zucchini to the skillet. 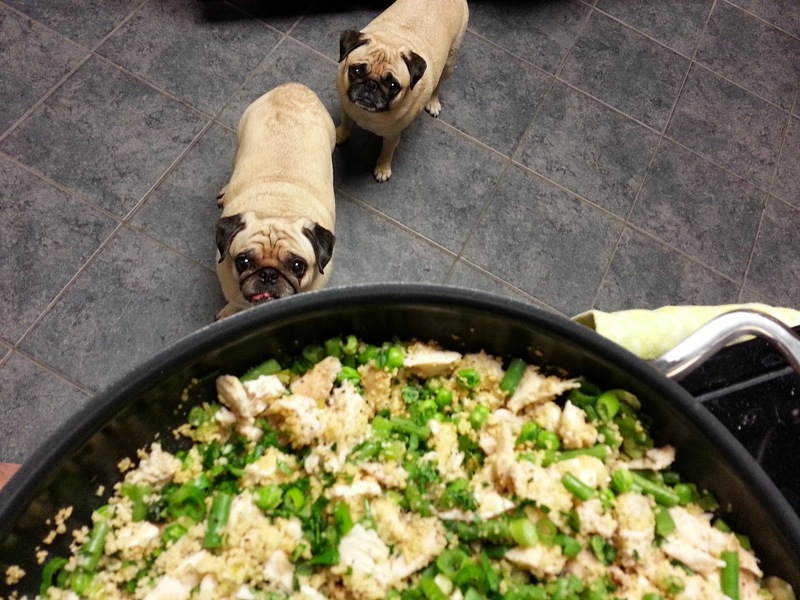 Stir together and cook for 2-4 minutes. Add the gnocchi, the can of diced tomatoes, and 1/2 tsp of crushed red pepper (optional) to the skillet and stir together. Cook for a couple more minutes. Remove skillet from heat and stir in 1/2 cup of basil. 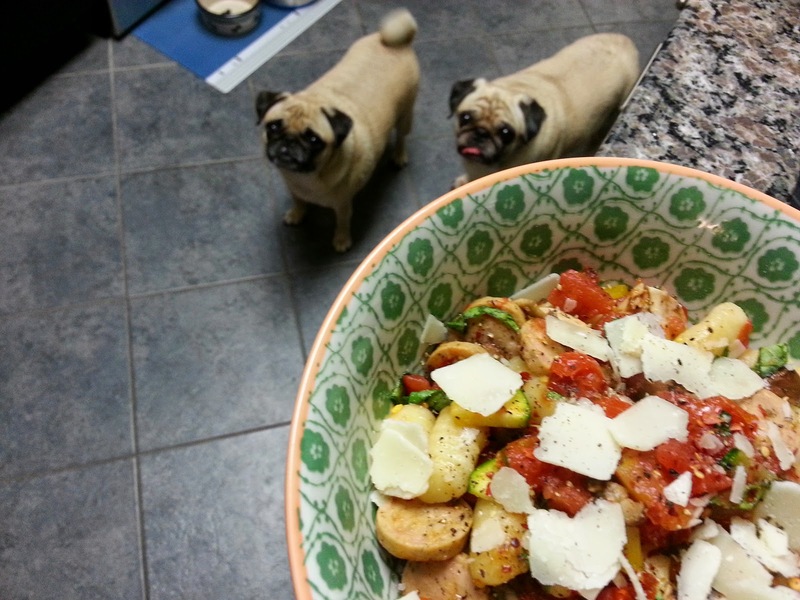 Salt and pepper to taste and top each bowl with some grated or shaved parmesan and enjoy! And now time for the pictures! 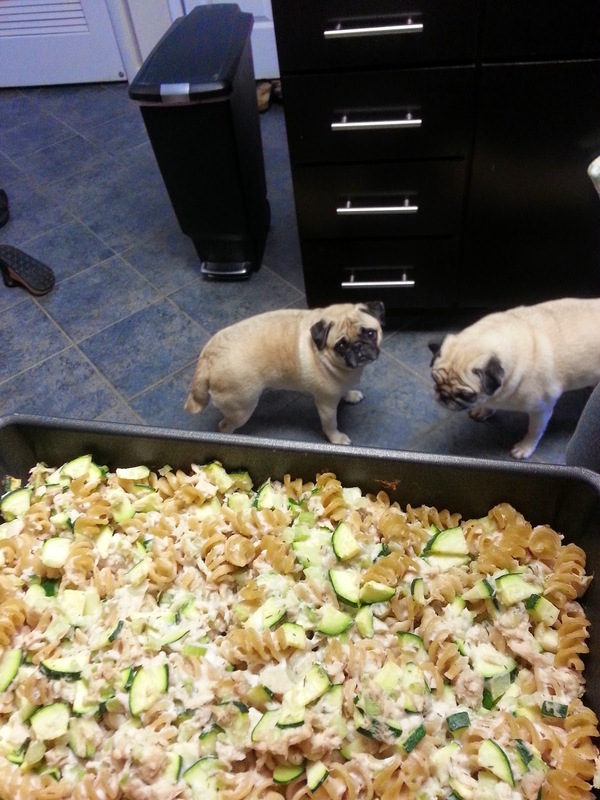 I'm never without my two sous chefs, Sunny and Rosy. Though it looks like one's sleeping on the job! This dish was so yummy and flavorful but I also loved how bright and colorful it was. I would've added more basil but most of my basil had already gone bad by the time I made this late in the week. Darn you perishables! I really wish I had a nice garden with some fresh basil. Basil is a nice topping and all but nothing really compares to cheese. CHEESE. And a nice sprinkling of coarse salt and black pepper and some crushed red pepper! 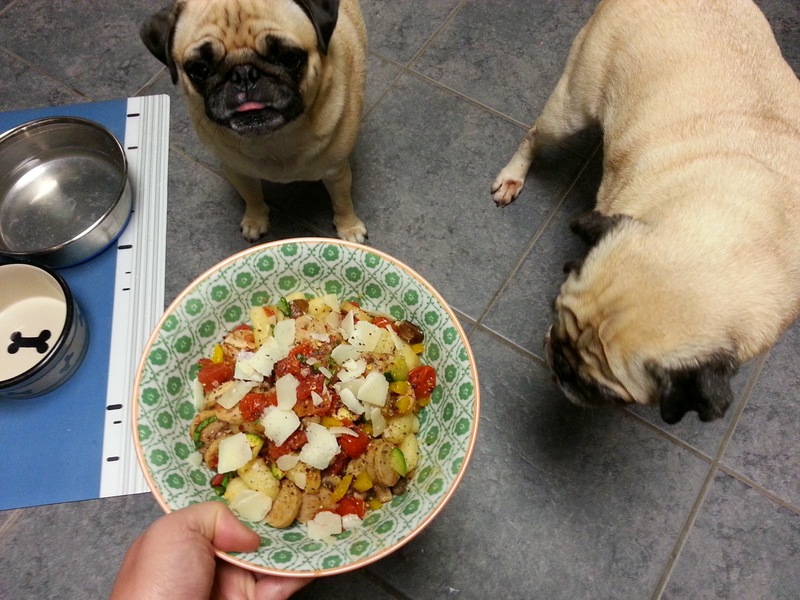 Rosy's tail was doing its happy helicopter twirl as soon as I got out the cheese. Rosy put your licker away! 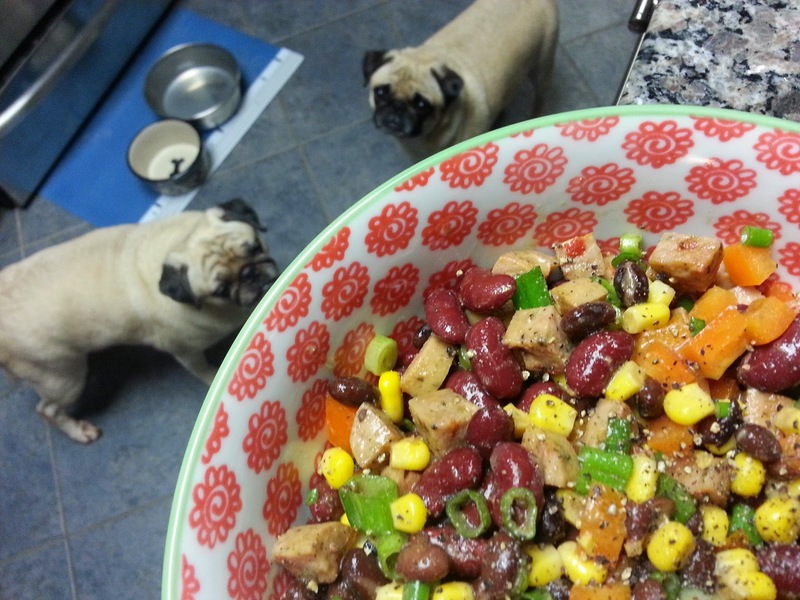 As soon as Rosy smelled the pepper the bowl lost all temptation. 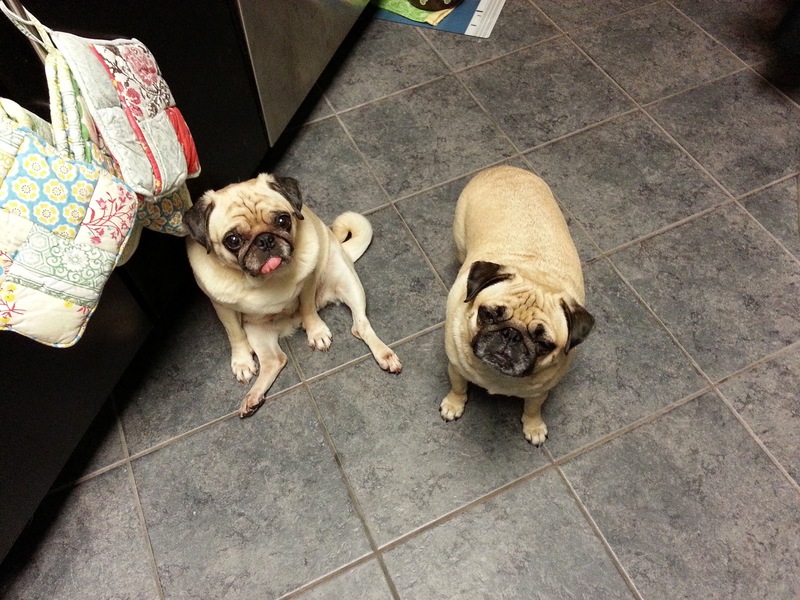 Instead Rosy and Sunny patiently waited for me to finish taking pictures so that they could get their own lil pepper-free parmesan slivers as treats. 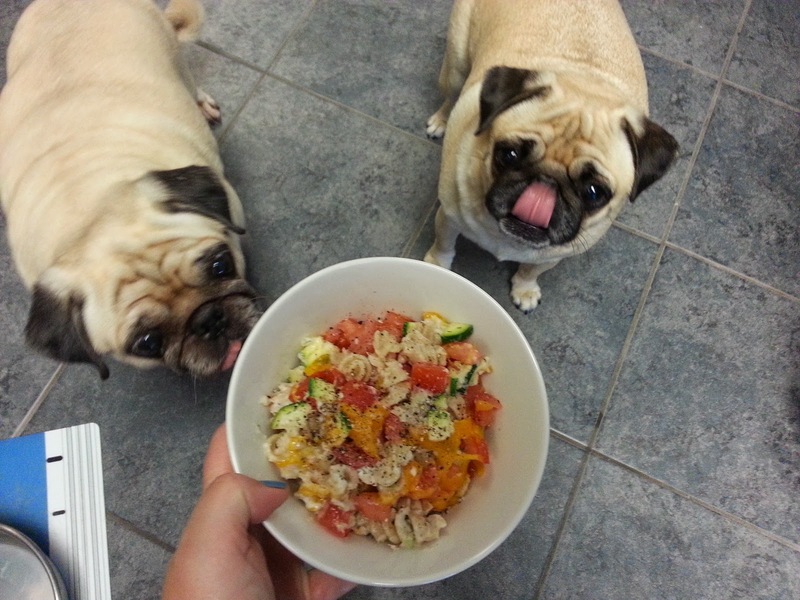 "Take that away human and place some fresh and clean parmesan stamps on our tongues!" Sigh. We're at that time of the year when I forget the horrid winter and start looking forward to fall. Oh DC, why must I live here and why must your summers be so brutal and disgusting? With a generous seasoning of salt and pepper, a crazy amount of Tabasco sauce splashed on it, and a nice ice cold drink, this is one of my regular standby summer dishes that I make repeatedly throughout summer. While you do need to use the stove for this, it's just to heat up some sausage. The rest is so simple and easy, you can throw this together at the end of a workday as you try to ignore the sweat dripping down your back from the lovely commute in an un-air conditioned packed metro car and walk home in an atmosphere that can best be described as hot jello. Better yet, make this the day before and refrigerate it so that you can dig into a nice and cool dish as soon as you get home. Servings: Original recipe says 10 servings and I laugh and laugh at that. No, this is more like 3-5. But it can be more servings if you use this as a filling for a sandwich or wrap. 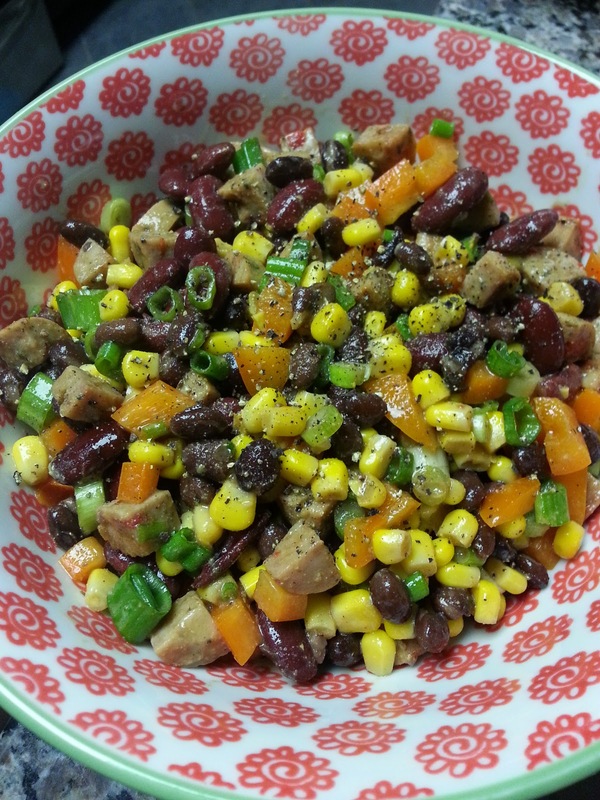 In a large bowl combine a can of corn, a can of black beans, a can of kidney beans, a chopped orange bell pepper, and 4 chopped scallions. In a small bowl, whisk together 3 tbsps olive oil, 2 tablespoons balsamic vinegar, 1 tbsp Dijon mustard, and the juice from one lemon (if you want this extra flavorful, be very generous with the balsamic vinegar and Dijon mustard (adding maybe up to an extra 1/2 tbsp)). Heat a large pan or skillet over medium heat and coat with cooking spray or a tbsp of oil. In the pan/skillet, cook 12 oz chopped chicken/turkey sausage for 5-9 minutes, or according to package instructions (choose a spicy sausage for some extra heat and flavor - I like Trader Joe's jalapeno chicken sausage). Add the sausage and the oil/vinegar dressing to the corn and bean mixture and combine all ingredients until everything is well coated with the dressing. Season with salt and pepper to taste and add some splashes of Tabasco sauce or other hot sauce if you'd like more spice, which I always do! Adds an extra vinegary punch too! 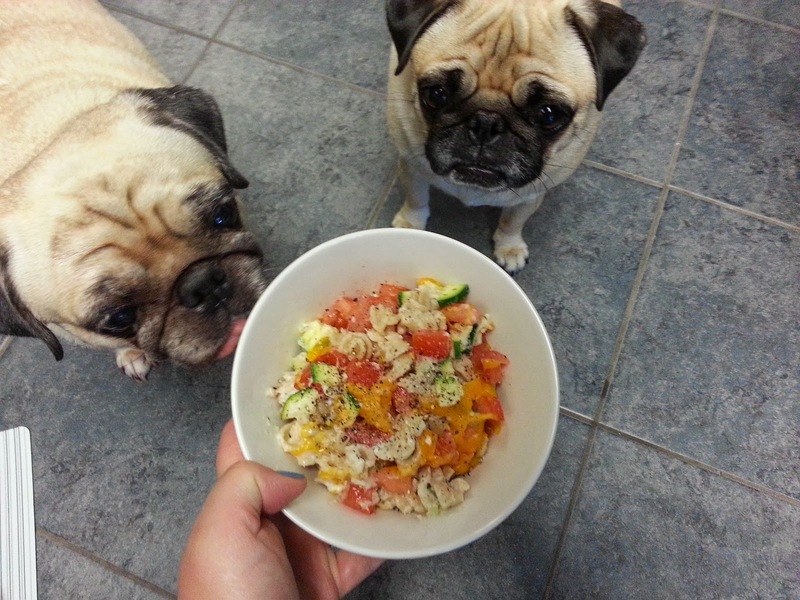 Now time for the pictures featuring my sad begging pugs! Look at those sad twinkling lil eyes. Sorry girls, but this is not dog-safe. Please don't cry Sunny! A good sprinkling of fresh cracked pepper makes such a difference on so many dishes! I also add Tabasco sauce to so so many of my dishes. I am seriously addicted. Put away those lil tongues girls! You may sniff, but don't touch. Or lick. Or eat. 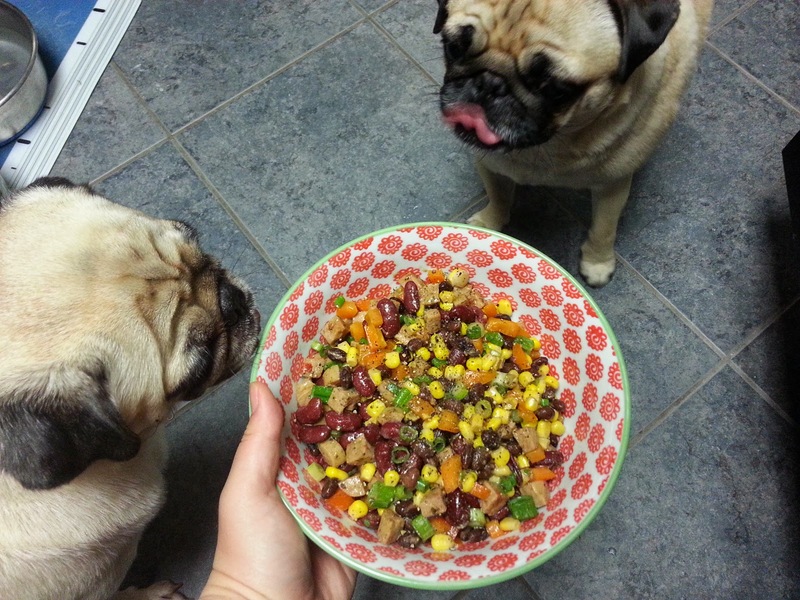 Ok ok I'll get a dog treat for you girls before I dig into this deliciousness! Adapted from SOS! The Six O'Clock Scramble to the Rescue. I love old school comfort foods even though I didn't grow up with most of them. My family mostly ate Korean food for dinner with occasional take-out/delivery foods, spaghetti, and burritos. 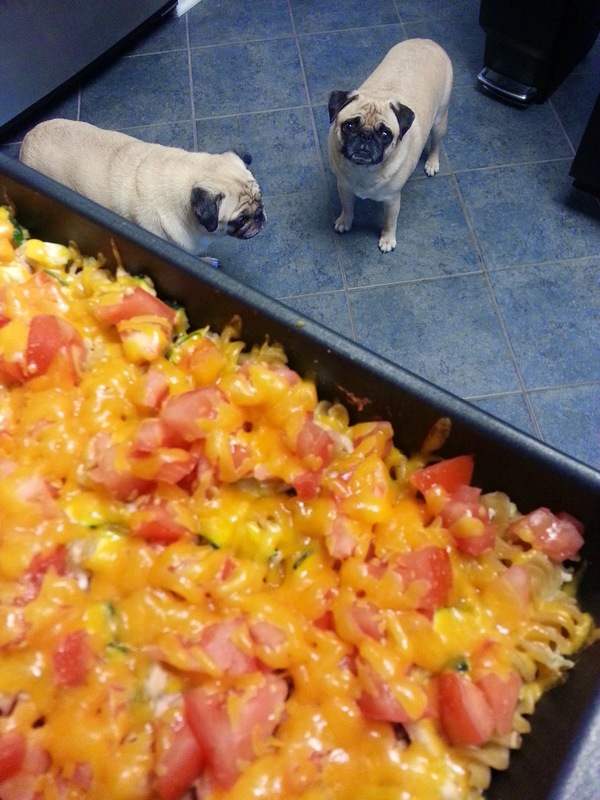 My mom never made any of the old school casseroles; they're something I discovered as an adult. One of the downsides to cooking is that you realize what goes into all those delicious dishes. And butter, fat, and salt make everything taste good! 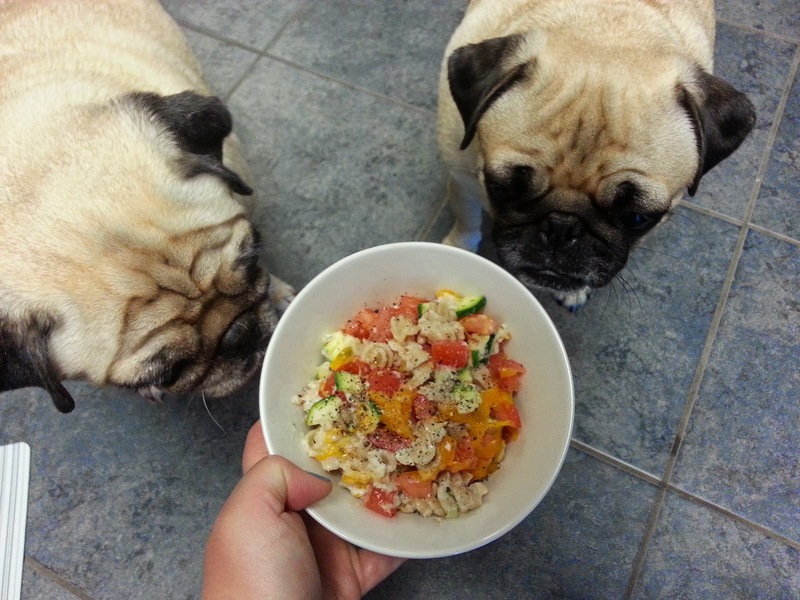 So this is a healthy spin on the classic tuna casserole dish. It doesn't use canned soup and incorporates more vegetables. It doesn't quite taste the same as the old school dish but it's really good in its own way. And you can eat this satisfying and filling dish without any guilt (or at the very least minimal guilt)! Cook 8 oz noodles according to its directions until al dente. Drain and set aside. Spray or grease a casserole dish and preheat oven to 350 degrees. In a small bowl combine 2 tbsps mayonnaise, 1/3 cup sour cream, 1/2 tsp salt, and 1/2 tsp dried dill until well mixed. 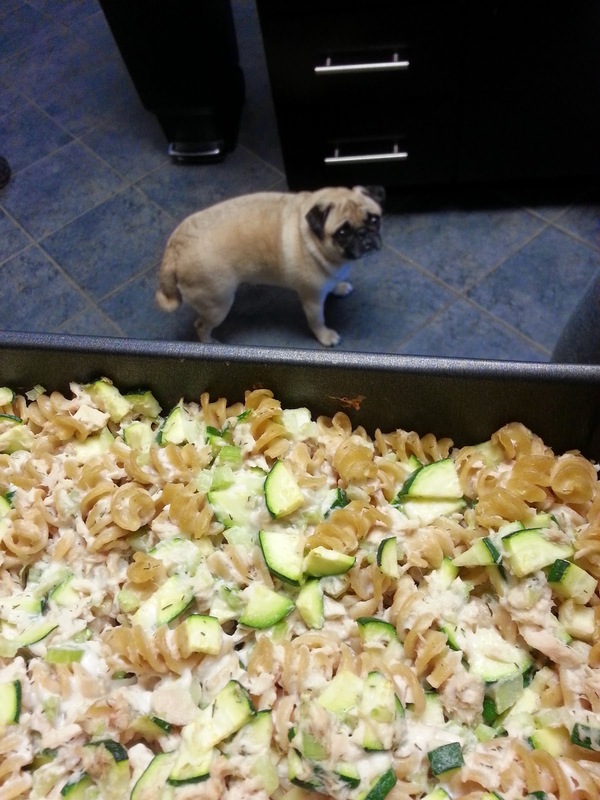 In a large bowl combine 1-2 chopped zucchini, 3 chopped celery stalks, 10 oz tuna, and the cooked pasta. Pour in the sour cream sauce and stir together until pasta mixture is well coated. Pour pasta mixture into the casserole dish and bake uncovered for 25 minutes. 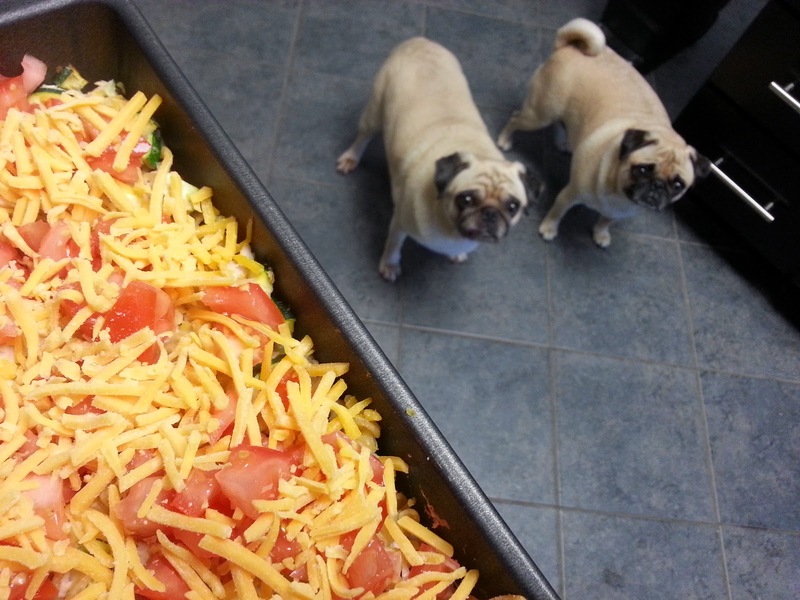 Take out the dish and top with 2 chopped tomatoes and 1 cup shredded cheese. Put back in oven for an additional 5-7 minutes. Season each dish with salt and pepper to taste. 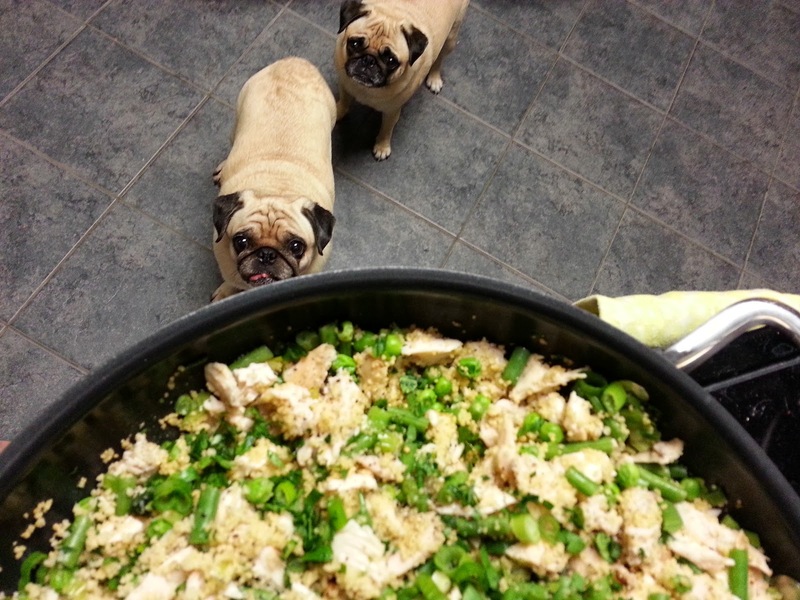 Any recipe here on Grubbin Pugs starts with pathetically sad begging pugs. Here's one. And then there were two (and my shoes). 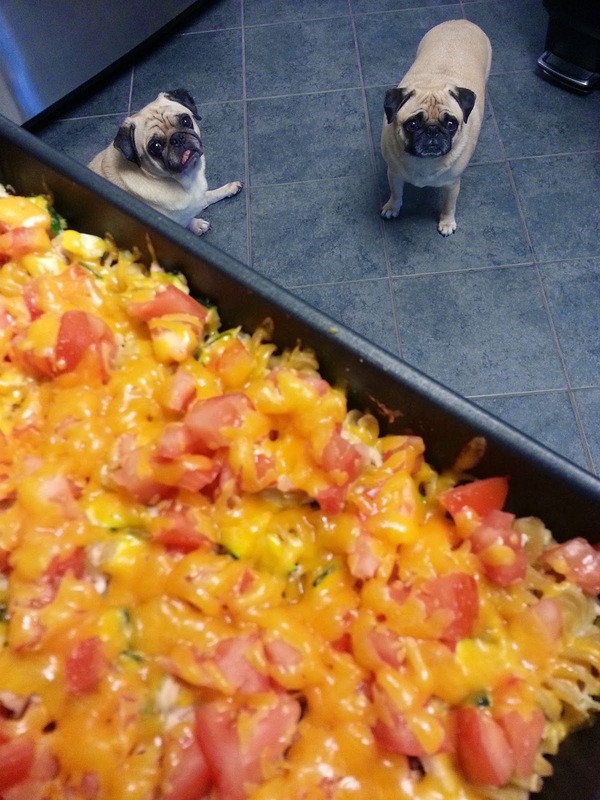 Anytime I bring out the cheese, Sunny and Rosy get really excited and hopeful. 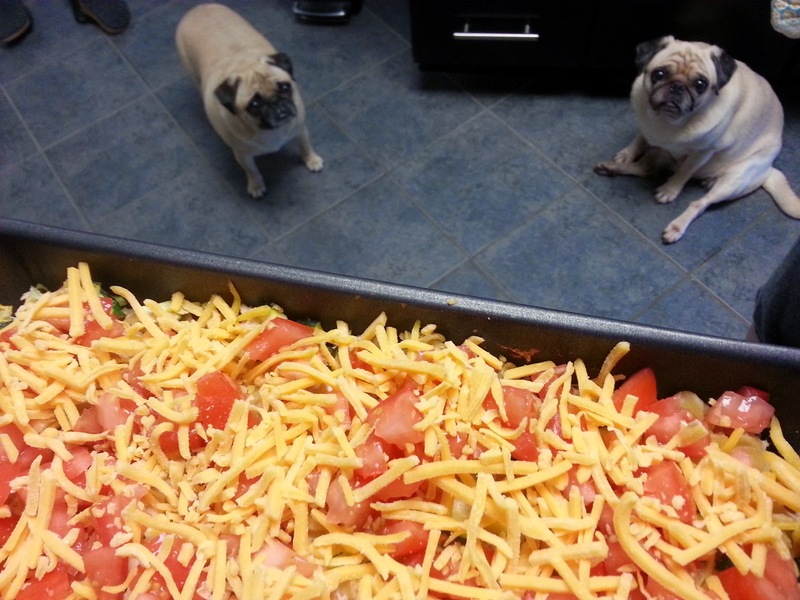 Because of course I have to give them a teensy bit of cheese! Rosy always does a little hopping dance as she waits for a sprinkle of cheese in her bowl. Pop it in the oven and out comes some gooey cheese. GOOEY! "Psst! Sunny she's done something magical to the cheese! It smells even more amazing now!" And with a little sprinkling of salt and pepper I'm ready to chow down! 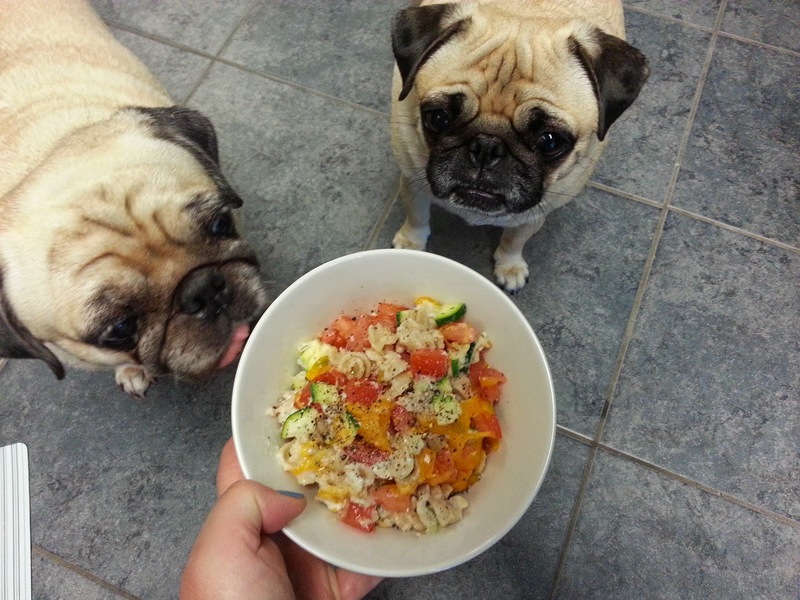 None for the girls but they did get some cheese as I mentioned before and a tiny bit of leftover tuna from the cans. Put those tongues away! Ok, time to take the bowl away before one of the girls manages to get a lick in. 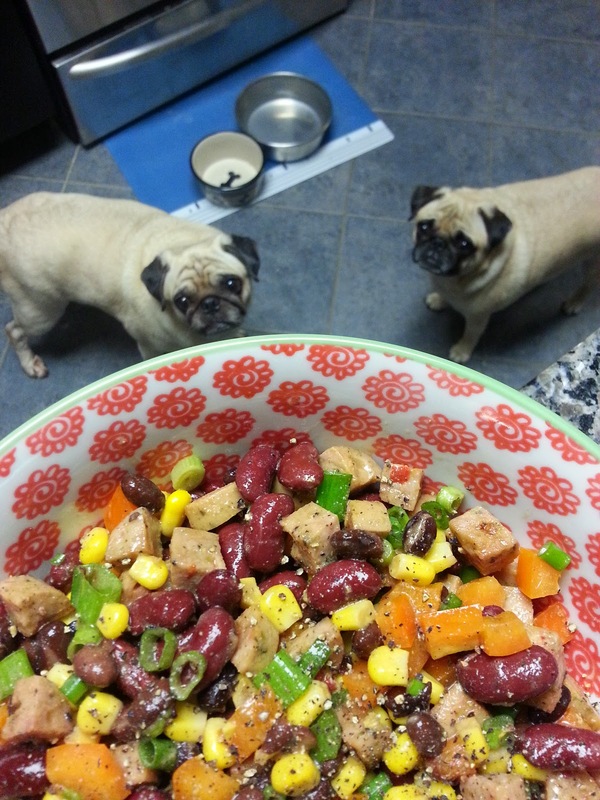 Now that the warmer weather is here I've been at a bit of a loss as to what to make for dinner lately. I don't want anything that will take too long, but it's not quite summer so I'm not really wanting any salads or cold dishes. I find spring to be the hardest time to come up with interesting and satisfying dishes. Winter dishes are my favorite, but as the temperature and humidity goes up and my holiday weight gain is still reluctant to completely go away (argh! ), I try to embrace some lighter meals around April-May. This is right around the time when I start making a lot of grain-based or couscous-based dishes. 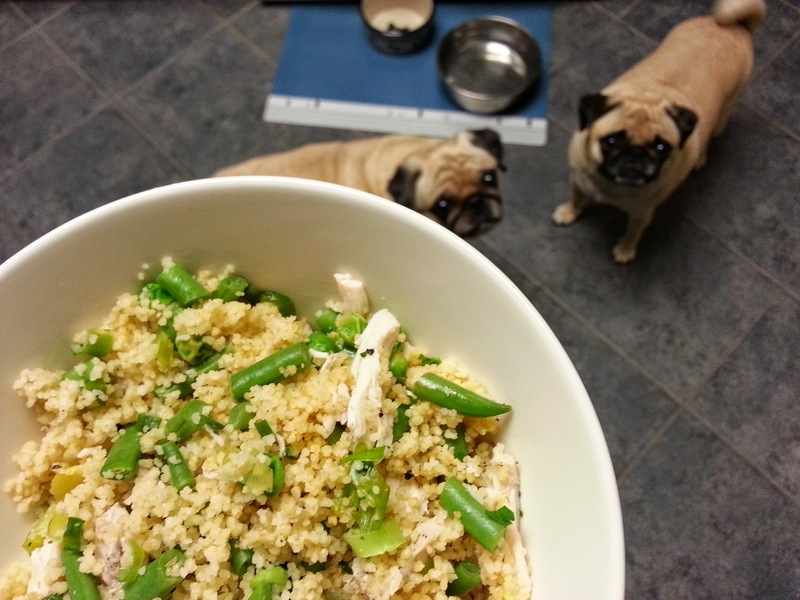 The spring vegetables and lemon juice here turn a regular chicken and couscous recipe into a springtime meal and this is so quick and easy it's great for weekday dinners. Spray a large saucepan or heat 1 tbsp of butter or olive oil over medium-high heat. 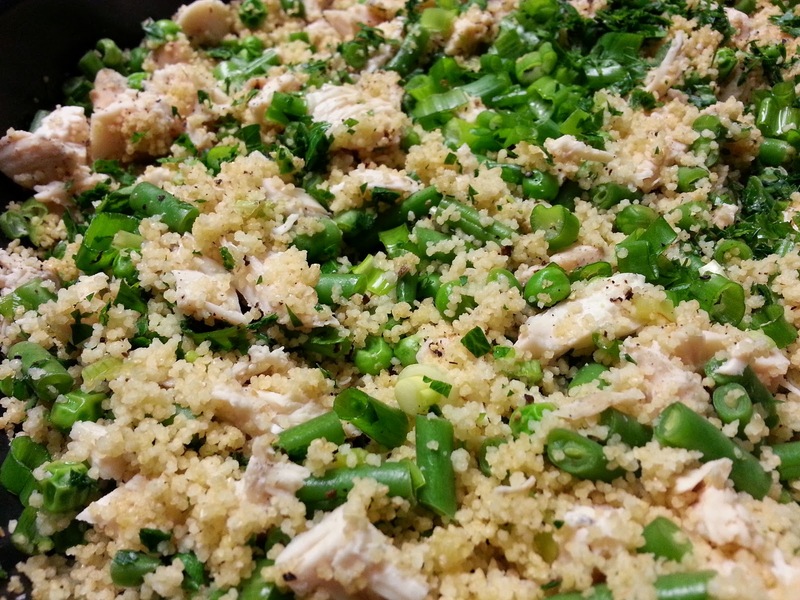 Add chopped scallions, stirring constantly, for 2-3 minutes until the scallions are softened. If you don't like wilted green scallion parts, then you can separate out the white and green parts and just cook the white parts at this stage and add the green parts later. I'm lazy and don't care so I just dump them all in at this point. Add 1-2 tsp minced garlic and 1/4 tsp thyme and cook for 30 seconds until garlic is fragrant. Add a few strips of lemon zest and 1 1/4 cups of water. Season with salt and pepper and bring the mixture to a boil. 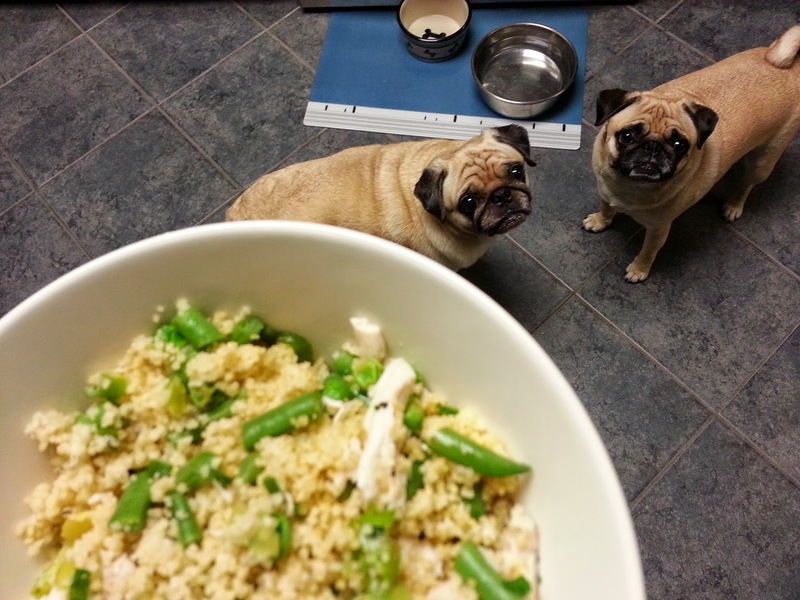 Add 12-16 oz chopped asparagus/green beans/haricot verts and 1/2 cup peas and bring back to a boil. 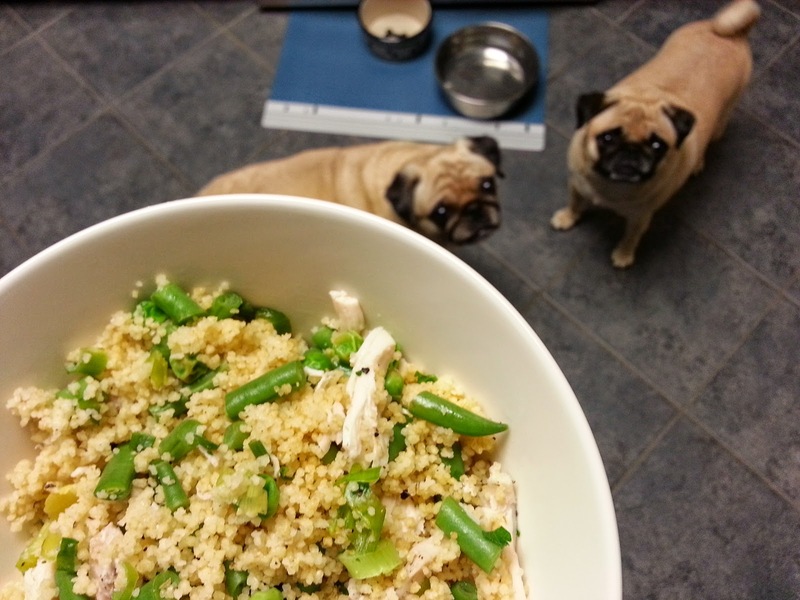 Stir in 1 cup couscous and add in 1-2 cups of chopped/shredded chicken. Cover pan, remove from heat, and let sit for 7 minutes. Remove lid and add lemon juice and season with salt and pepper to taste. Serve with a sprinkling of parsley on top. Now for some pictures! 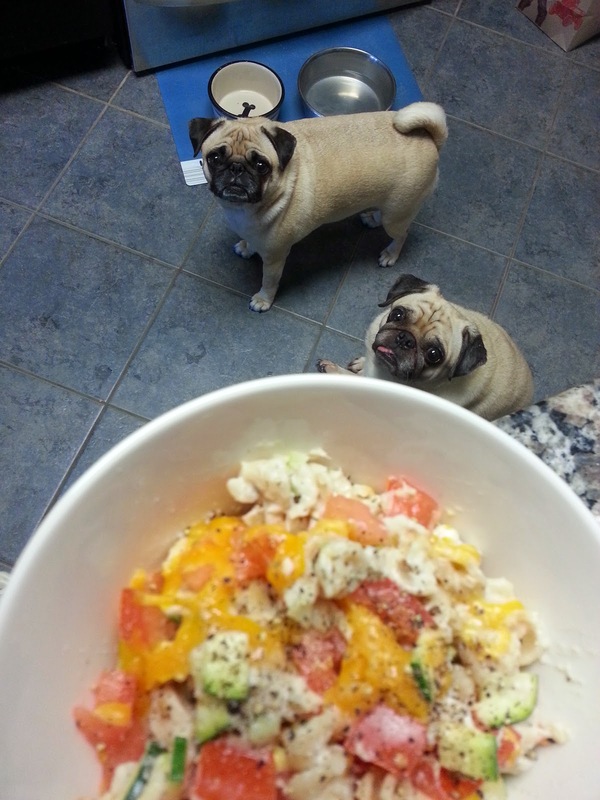 Anytime I cook anything with chicken, Sunny and Rosy promptly make their presence known in the kitchen. It's really hard to ignore their begging faces and sad uncurled tails. Could they get any closer to the stove? Sometimes I have to nudge them away with my feet because there's nowhere for me to stand while I'm cooking! Yeah...I usually add a lot more salt and pepper after I take photos. But I don't think you want to see a pile of salt and pepper so I focus on the actual food for the blog. But with this recipe, a good seasoning of salt and pepper and lots of lemon juice really makes this dish! Sniff sniff. 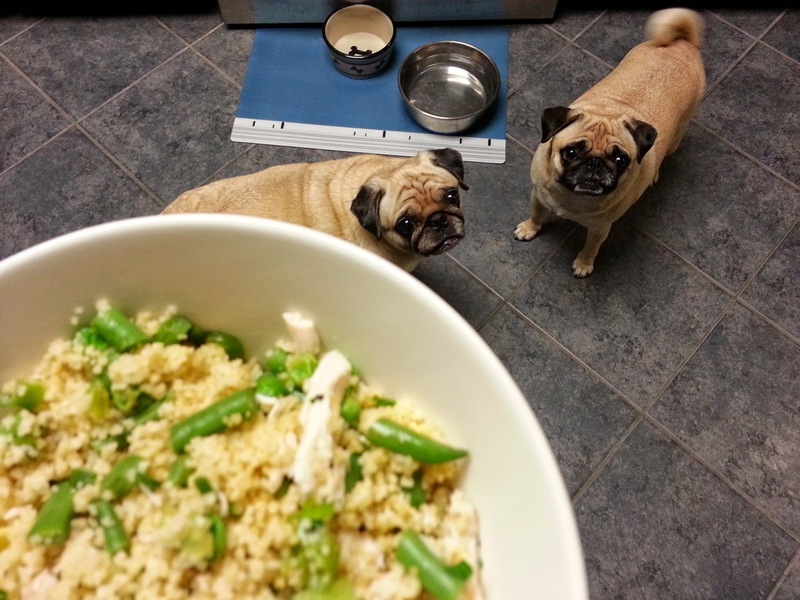 None for the pugs of course but I always put aside some plain chicken when I'm cooking for a treat after taking photos! 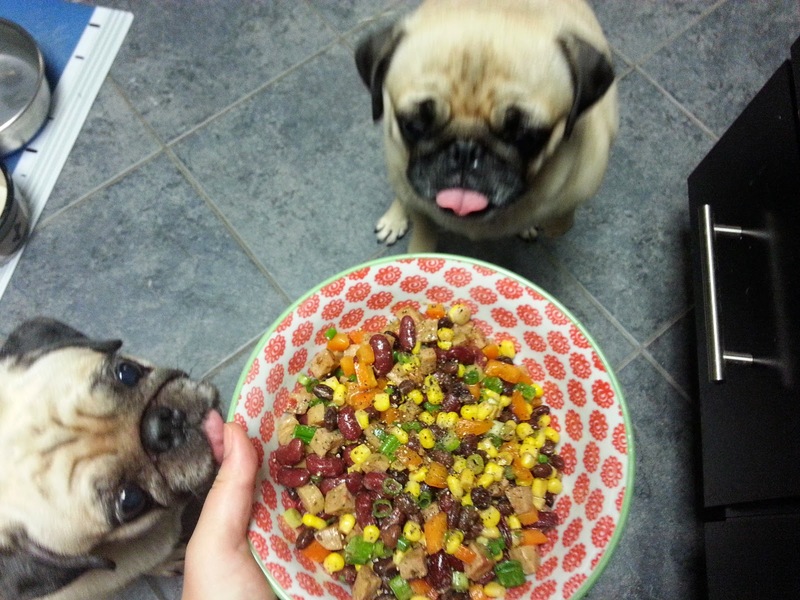 Pugs are very very food oriented in case you didn't know. Pose for me! Smile! Look happy! And there goes Rosy's tail. 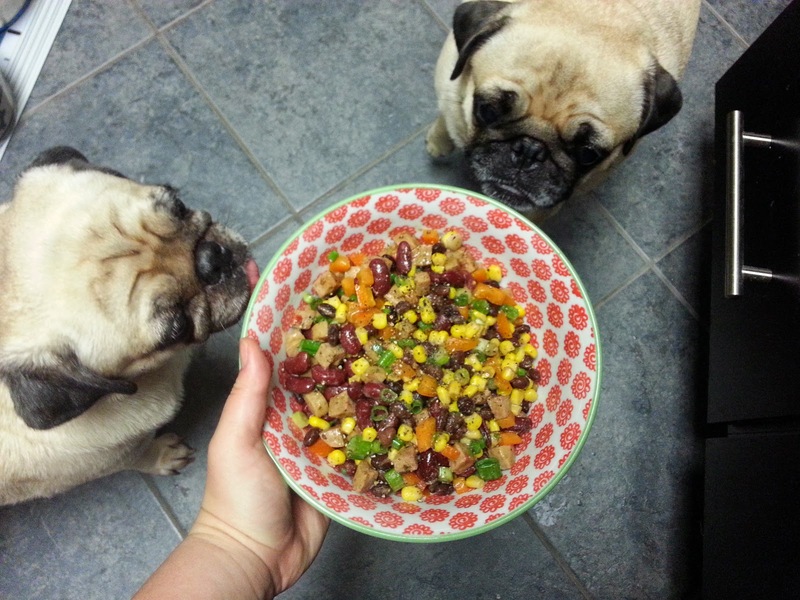 I am always torn between focusing on the food or my pugs, which is silly because we all know what's most important on this food blog...PUGS. 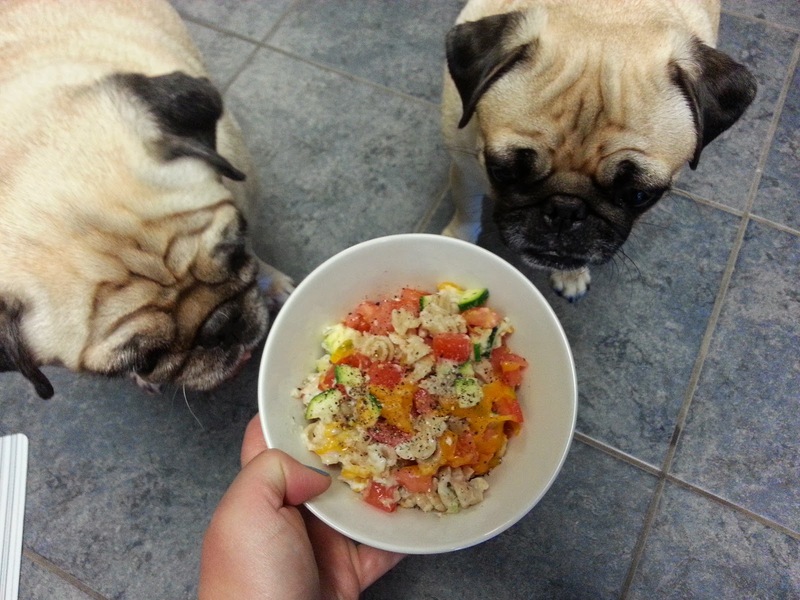 But here's one focused on the food just for giggles. No Knead Bread - So Easy, So Tasty! 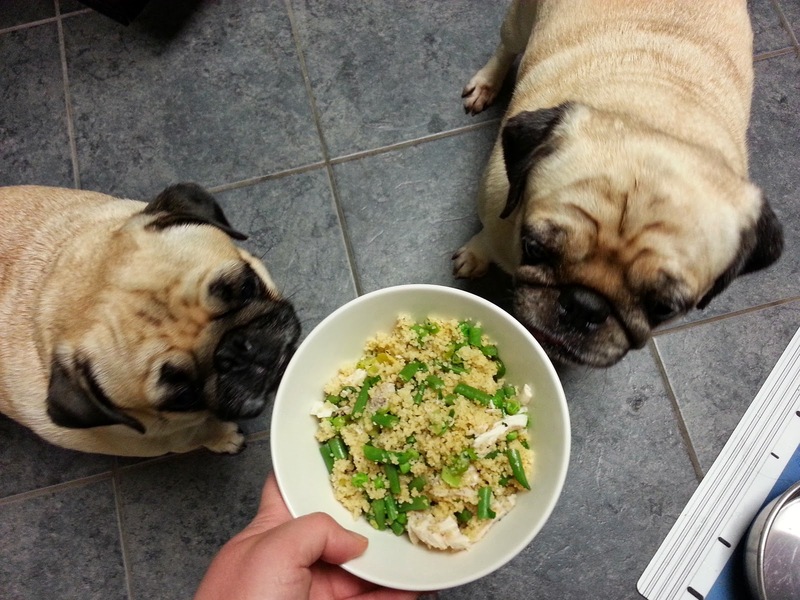 All content is © 2013-2019 Grubbin' Pugs. Please do not use anything without express permission. Simple theme. Powered by Blogger.